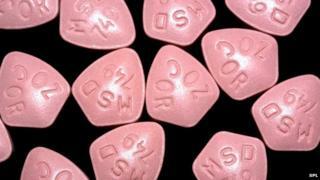 Statins may be useful in treating advanced multiple sclerosis (MS), say UK researchers. Usually, after around 10 years, around half of people with MS will go on to develop more advanced disease - known as secondary progressive MS.
For their phase two trial, which is published in the Lancet, Dr Chataway's team randomly assigned 140 people with secondary progressive MS to receive either 80mg of a statin called simvastatin or a placebo for two years. The high, daily dose of simvastatin was well tolerated and slowed brain shrinkage by 43% over two years compared with the placebo. Dr Chataway said: "Caution should be taken regarding over-interpretation of our brain imaging findings, because these might not necessarily translate into clinical benefit. However, our promising results warrant further investigation in larger phase three disability-driven trials." The researchers believe statins may have anti-inflammatory and neuroprotective properties that can guard the nerves from damage. In an accompanying editorial, Jacqueline Palace from the John Radcliffe Hospital, Oxford, and Neil Robertson from Cardiff University in Wales, said the trial represented a promising starting point in the quest to find a treatment for secondary progressive MS.
Dr Susan Kohlhaas, head of biomedical research at the MS Society, said: "There are no treatments that can stop the condition from worsening in people with progressive MS. Scientists have worked for years to find a potential treatment that could help people, and now, finally, one has been found that might. This is very exciting news. "Further, larger clinical trials are now absolutely crucial to confirm the safety and effectiveness of this treatment." Statin debate: A bitter pill to swallow?